Historic? Yes Emotional? That too. Prayerful? Yep. All day I’ve been aware of a twin-track feeling about the debate. There’s the intense interest within Synod, with people whose lives and ministry may be radically affected by this development. And then there is the huge appetite for news and comment outside, evidenced particularly by the vast number of tweets throughout the day at #synod. My day started with the Communion service in the distant chapel room. Much fuller than on Saturday, with a thoughtful short homily from the Bishop of Leeds, Nick Baines, drawing on his own extensive knowledge of Germany (and the footy result) and talking about the need to walk together today and in the future. Breakfast conversations were subdued, everyone’s mind on the debate. But first Synod looked at the Armed Forces Covenant, with some passionate speeches about the need for the parish church to support families of service personnel when they are overseas, and when they return. I counted 8 TV/satellite trucks parked up outside the hall. Inside, the little boxes that hold the electronic voting machines were practically empty – everyone had grabbed one on their way in, ready to vote. 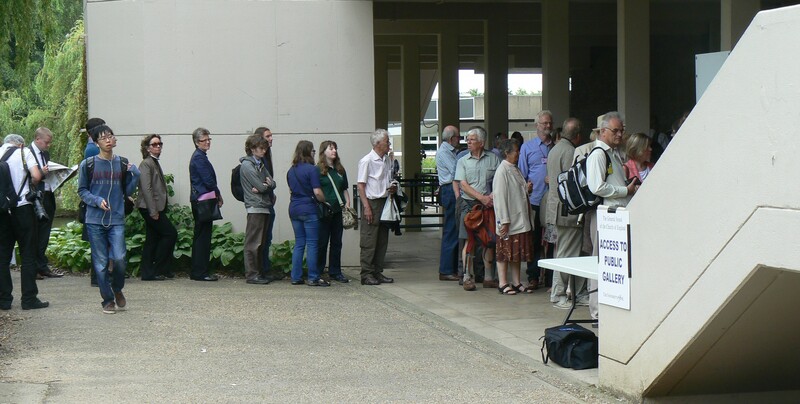 Mind you, it wasn’t necessary to get a machine in the morning – we all knew the vote was not till late afternoon. The hall was as full as I’ve ever seen it. Many of our women clergy were in bright colours, some knowing they would be nobbled to TV interviews at some point in the day. And there was a queue to get into the public gallery. Archbishop Sentamu was in the chair. He gently pointed out that 82 people have indicated a wish to speak. He hoped some would not stand if someone else said what they had planned to say, and quoted the Standing Order about ‘tedious repetition’ (which enables the Chair to order someone to sit down and shut up). Introducing the main debate, the Bishop of Rochester pointed out that there is very little that is new today. The bulk of ‘the package’ as we are calling it, is what diocese overwhelmingly voted in favour of. The only new thing is the Note from the Archbishops expressing their intention to find a way to appoint a ‘headship evangelical’ to the House of Bishops. As it turned out, this was to be a significant factor in speeches from a number of conservative evangelicals. Sometimes it’s really hard to read Synod. But the opening speeches gave clear signals that the package would go through. The (lay) theologian Paula Gooder gave a cheerful theological exposition of Paul’s understanding of reconciliation, and then came a very clear indicator. The Chair of the House of Laity, Philip Giddings – who was widely criticised (not necessarily accurately) for leading the No votes in that House last time – stood to speak. He was heard in a very attentive silence and you could almost hear the sigh of relief when he announced he would be voting in favour. Swing voting: Yes, No or Abstain? We then heard a round of speeches from people taking different positions. On the No side, the Bishop of Burnley (a traditionalist Catholic) expressed hope that it would all work very well, though he in conscience would be voting against. Dr Jane Patterson, describing herself as a ‘complementarian’ (i.e. ‘headship evangelical’ in my shorthand) is a lay member of the Crown Nominations Commission, who appoint Bishops. She said how hard it had been to appoint Bishops from that stable, and, reflecting the views of a number of Sheffield churches, she would be voting against. The Bishop of Blackburn, Julian Henderson (previously a No voter) spoke of the first-ever ordination of women as priests by a diocesan Bishop there. He would be voting Yes, acknowledging that he would have to work on relationships and appointments in this largely traditionalist diocese from now on. Prudence Dailey, a Synod and Prayer Book Society leading light was one who voted to ‘stop the bus’ last time. Today she said she would abstain. Most movingly, Adrian Vincent kept us all guessing as he outlined the tensions he’s felt representing both conservative evangelicals and traditionalist catholics from his diocese. But he said he would now vote in favour, despite feeling he is betraying people back home. And there was a trickle of objectors, like David Banting, who expressed gratitude for the atmosphere in his diocese (Chelmsford); but went on to state his Reform view, citing the 39 Articles and modern social trends to remove all references to differences between men and women. He was received in silence, and there was only muted applause. Christina Rees, long-term campaigner on women’s ordination, made a moving speech. On the big screens you could see she was holding back tears as she expressed the hope some objectors would abstain in the spirit of the current package. She was immediately followed by David Houlding, a long-term objector from Forward in Faith, wanting to apologise for the way we have all conducted ourselves in this matter over recent years. He believed that following the Porter Way (facilitated conversations over the last year organised by David Porter) had made us all see everything in a different way. We must move on, he said – but did not declare how he was going to vote, though his tone was one of support, not objection. We broke for lunch with – very unusually some silence, a prayer, and Sentamu-led singing of an African song Thuma Mina. All very different to 2012. No doubt some had too much lunch: others clearly felt we should move to a vote as soon as possible. 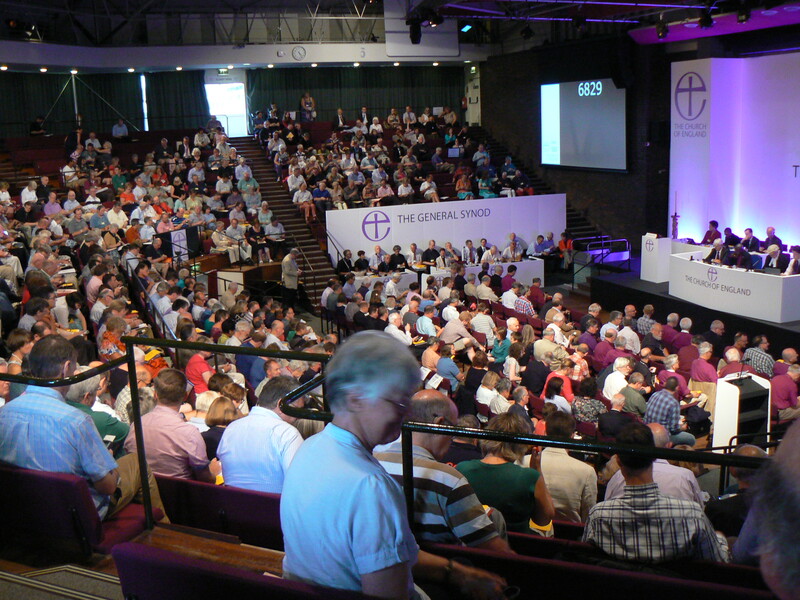 There were plenty of the 82 would-be speakers still to come and Archbishop Sentamu issued a headmasterly reminder that the speech limit would be 3 minutes, and any repetition would be stopped. 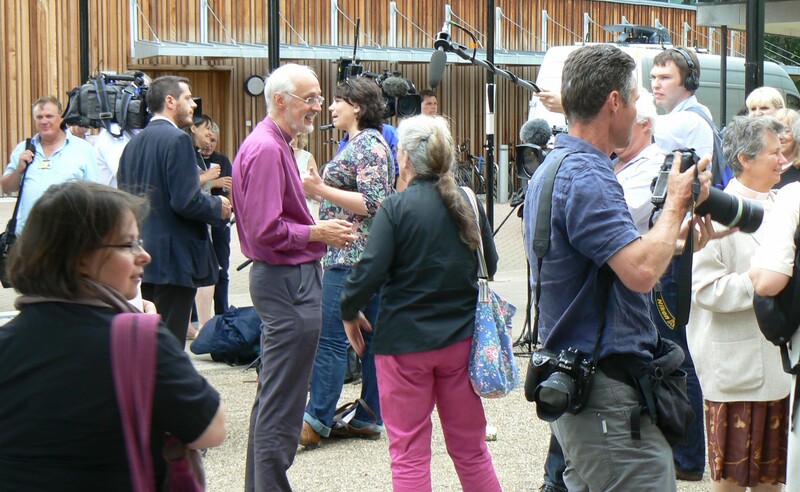 It got pretty dull, though noises emanating from Reform’s Rod Thomas and Lorna Ashworth indicated that though they could not vote Yes, they do want to be engaged with Anglican life, rather than detached from it. From the traditional Catholic end there was a claim that to vote Yes would be the end of the Church of England. More positively, Philip North suggested the package will go through and we need to put our energies into ‘winning the peace’: making sure that all parties are treated well and flourish once the legislation is on place. Not all the speeches were predictable. Jane Bisson from Jersey held up a Bible and suggested that to vote Yes was to desert it. David Kemp from Canterbury read a fantasy/parable about a conversation between God and an otter! By mid-afternoon it was all getting pretty scratchy. Speeches were down to 2 minutes, but people kept popping up, just avoiding Sentamu’s wrath by not teetering over into tedious repetition. But then suddenly it all cheered up. Soon after 4.00, Sentamu gave three speakers 5 minutes each. The Bishop of Chichester reminded us that although his diocese has been known as a bastion of male ministry, he is bringing a change of culture there, though being a traditionalist Catholic himself. After the alternation of love-in and grumpy acceptance that has been the course of today, Archbishop Justin’s contribution came as a fresh wave on a hot day. The House of Bishops will stick to the Declaration. We have to work hard from now on. We want to be a church where all can participate. And so on. Lastly, John Spence, Chair of the Finance Committee of the Archbishops Council – self-labelled a ‘new boy’. He makes us laugh and has us eating out of his hands. He told the story of how he lost his sight as a man in his 30s. He expected to be cast into the wastelands of life, and was told he could not be promoted because he could not manage people. But he went on to become MD of Lloyds Bank. His faith in others to work with him was repaid. As he adapted, other people adapted with him. He appealed to those still thinking about which button to press on the voting machine. Can you place your trust when there is not yet evidence? (Reflecting something Jim Wallis had said at the Minster). As you trust, you will create a whole new range of possibilities. The stronger the vote, the greater confidence the outside world will have in us; but more than that, the church will be a better witness and Christ will be at the centre. John Spence’s speech was a barnstorming performance: a standing ovation followed – very rare indeed at Synod, for anyone or anything. The Bishop of Rochester summed up, and after that, if you were in any doubt, the voting figures speak for themselves. My pictures are probably technically against Standing Orders. Despite what you may see on TV, there were no hands in the air, as we use voting machines, which are activated via a little card and a PIN shown on the big screen. First, the Catholic Group, though obviously not reconciled to this, seem to have decided not to explicitly oppose it or appear to ask what I call ‘grumbly’ questions; whereas the ‘headship evangelicals’ are not reconciled, and kept plugging away at issues like having a bishop of their views soon, and repeating the theological points we know so well. Second, Outside interest is huge. The media scrum was something to see. BBC, ITV, Sky and others. 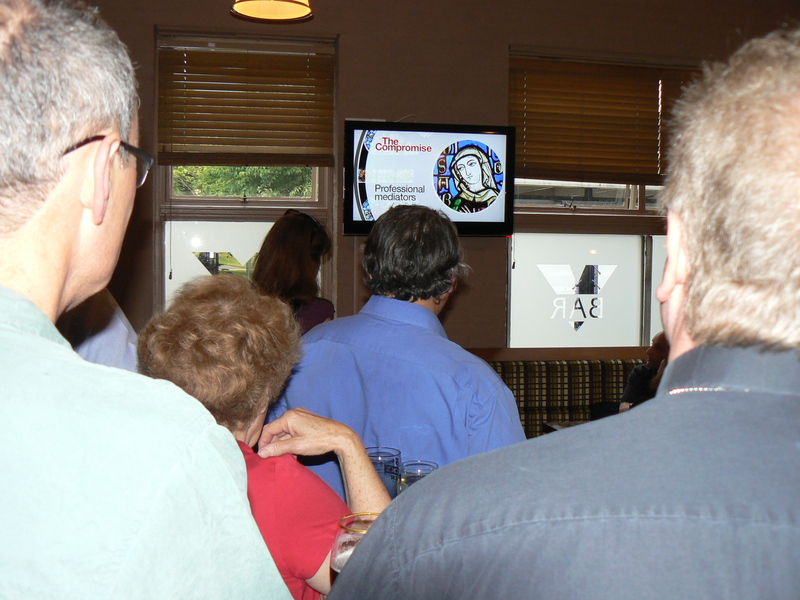 Afterwards a number of leading women clergy and others were in the Vanbrugh bar when the 6 o’clock news came on the TV. There was some whooping and yelling when we were the lead story (as we were at 10.00 as well). Every time one of them appeared on screen (and at least half a dozen of them did) there was applause. A group of Americans on a microbiology course at York University were completely puzzled by all this – until they realised they were in the presence of the very people who were the national news’ lead story today. Third, people in parishes will largely be delighted. There will now be pressure to understand the timetable that will lead to the first episcopal appointments. There are plenty of vacancies in dioceses at present, and probably some suffragans too. The tricksy task of matching potential women candidates to specific vacancies will not be as simple as the papers suggest when they profile someone as Will this be the first woman Bishop? You have to match an individual’s gifts and skills to the needs of the diocese, and in doing that discern God’s call. But shortlists will have women on them by the end of the year, most likely. Lastly, those campaigning for this change are both delighted and wrung-out after years of struggle. There is no sense of ‘victory’ or triumphalism. They know that those who voted No are in a very uncomfortable position, and I sense there will be some supportive pastoral work going on in dioceses and deaneries as everyone comes to terms with this. If this is to work, the atmosphere of discussion, prayer and trust that has worked at national level will need to be transferred to dioceses, deaneries and parishes. The official Church of England statements with quotes from Archbishops Justin and Sentamu can be found here. Our Bath and Wells Bishops have written to all our licenced clergy. They have also made a public statement. You can compare my account with Jeremy Fletcher’s if you want to, His might be more accurate! 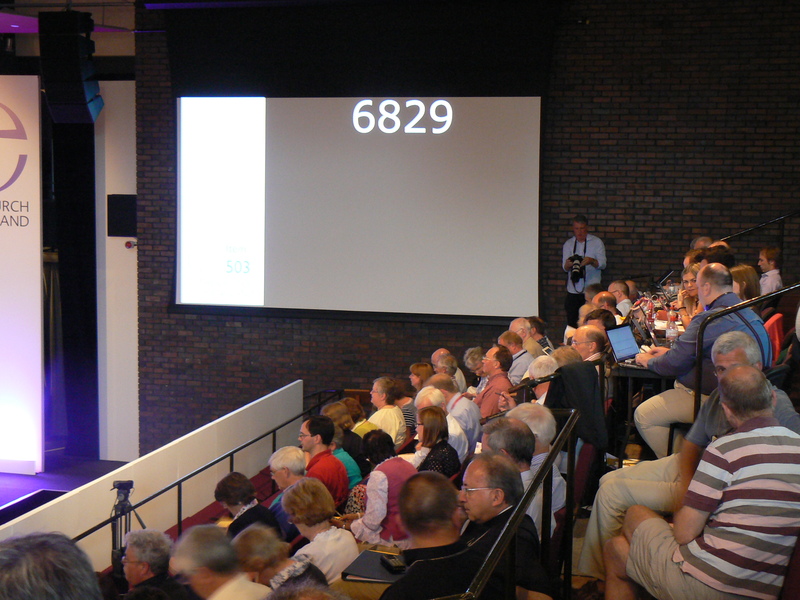 This entry was posted in 2014: July - York, General Synod and tagged Archbishop Sentamu, electronic voting machines, General Synod, women Bishops. Bookmark the permalink.